For several years back in the 1990s and early 2000s, Wesley Snipes was the pride of Orlando. The son of a teacher's assistant and aircraft engineer, Snipes' parents divorced when he was 2 moved with his mother to the South Bronx. He attended the High School for the Performing Arts in New York City but had to withdraw when his mother moved back to Orlando. He graduated from Jones High School and began performing in regional plays and dinner theater productions before an agent discovered him and he was cast in a Goldie Hawn movie, Wildcats, in 1986. In 1989, he gained attention as flashy ballplayer "Willie Mays Hays" in Major League, followed by major roles in New Jack City and Spike Lee's Mo' Better Blues and Jungle Fever. He went on to star in Passenger 57, White Me Can't Jump, Demolition Man and the Blade trilogy. He bought a mansion near Orlando to be close to his mother and appeared to have it all. You would think someone would this much success would be smart enough not to fall victim to the schemes of charlatan tax-avoidance counselor, but nope, Snipes fell hook, line and sinker for the lame scheme of one self professed evangelical "tax defier" Eddie Ray Kahn and in 2008 the two were convicted for tax evasion and sent to prison. Kahn operated organizations called the Guilding Light of God Ministries and American Rights Litigators and employed tactics that "wreaked havoc on the IRS," including forcing agents to respond to thousands of bogus documents, and sending in frivolous letters instead of tax returns and fake, checklike "bills of exchange" instead of actual checks, the Orlando Sentinel reported. Snipes was among Kahn's clients who tried his strategies. Snipes reported to prison to serve a three-year sentence in December 2010 and was released in April 2013. Kahn was sentenced to a 10-year term. 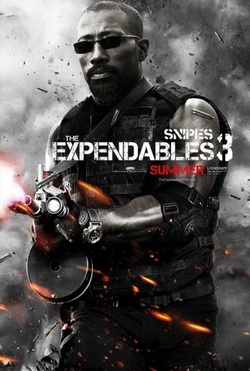 Snipes says he hope to make a Blade 4 film and is co-starring in The Expendables 3, due for release on Aug. 14.